This document describes the typical Git workflow that all Flux members are expected to follow. It functions as a backup for all your work; the repo is backed up while your laptop or emulab node is not. Permits easy collaboration with other Flux members as well as external collaborators. Makes it easy to push changes around within Emulab, say from your laptop to your elabinelab; push to your public clone and then pull from someplace else. Most branches are local to you and do not pollute the main repository; create as many branches as you like, the rest of us do not see them. This avoids branches that are never resolved (joined) in the main repository. Lastly, it functions as a record of individual work, as for reporting, proposals, budget justifications, etc. For many of us, our commit messages are better records of what we have done. Flux members are expected to push their work from their various private repositories to their public one on a regular basis. Need to define regular. Is it daily? Topic branches are strongly encouraged instead of working on the master branch. All of the changes that you pulled into clone2 are sent over to clone1. What if you had already pulled those changes into clone1? That is okay, since the changes all have unique hashes; a change in clone2 that is already in clone1, will be ignored. Note: Git will say "Initialized empty Git repository in ..." Do not worry; your new repository is not really empty. 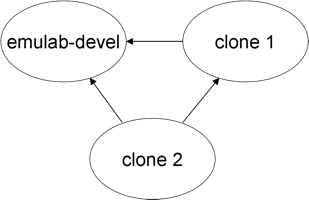 Create your private repository by cloning your public clone on your work machine. You may create as many private repositories in different places as you like, but for this discussion we'll just work with one. Add the main repository as a "remote" of your private repository so that you can publish your work with a 'git push' command. Commits to the main repository will flow through your private clone to your public clone; you will not need to log into git-public to manage your public clone. git config --global user.email "yourid@flux.utah.edu"
Set the name of your repo - this is the short string that will be included in the subject line of mail messages. Suggested: 'emulab-<username>'. (This will also be placed in an X-Git-Repo header in the mail for easy procmailing). Tell gitmail to not send mail about commits that are already in the main emulab-devel repo. This is necessary to avoid seeing tons of irrelevant mail when you do a push into your public repo. Tell gitmail to not include trivial merge commits in the commit email. For a merge to be considered trivial, each file changed must be identical to at least one parent's version of that file. In addition, the commit message for the merge must also be the default one generated by git. Merges are very common when using git, so only including merge commits where files had to be merged (or changed to resolve conflicts) reduces the noise for those reading your commit emails. Send a test email - if it works, you're done! Now, lets do some development work. First, create a branch in your public repository by pushing the head of the current local branch to a new remote branch. Then checkout the remote branch locally. This will also make sure your local branch tracks the remote branch. If mybranch already exists in your public repository and you want to work on it in this private repository, create a local branch that tracks the branch in the public repository. As you work in the new branch, you should regularly commit your work to the new branch in your private repository. When working on a topic branch you may find that there are upstream changes to master that you need to apply to your branch. There are two ways to do this: merging and rebasing. Which method you use is mostly up to you. Merging is always safe, but adds a merge commit each time. This can make the history more complicated and harder to follow, but it also shows exactly when you applied upstream changes to your branch. Rebasing is useful if you decide that the current master branch head is a better starting point for your topic than where you originally started it. This may happen if someone else committed something to master that directly affects your topic, and you don't want to show that you had to merge those changes in. This helps to keep the history of your branch simple and linear. Note that you MUST merge if you collaborate with other developers by asking them to pull changes from your branch. Rebasing would change the history and create problems for the other developers when they try to get your latest changes. This will merge changes from central/master into mybranch. The --no-ff option tells git to create a merge commit even if it would normally do a fast-forward merge. If you see this, you will need to resolve those conflicts by hand and mark the conflicts as resolved by re-adding the changed files. If you will not continue development on this topic branch, you can delete it from your private repository and your public repository. This reversion will be a plain commit just like any other, so you can inspect it, push it to other repositories if appropriate, or discard it if necessary (see above). This was caused by merging master into your topic branch (or pulling emulab-devel's master branch into your master branch). Doing this will result in a very hard-to-follow history that makes tasks like reverting merge commits difficult. To prevent this problem a hook script has been installed that prevents these commits from being pushed. Use one of the following solutions to fix your history so so that your push will be successful. That is all that needs to be done on the master branch. Unfortunately, subsequent merges involving the same branches is complicated by the fact that a reversion now exists on master. The easiest way to cope is to fork a new branch from master after the reversion, and duplicate your earlier work onto it. If this is unsuitable for some reason, there are alternative approaches to recovering, although they have drawbacks too. If the file is supposed to be text, make sure all line endings are the same (either LF or CRLF, not a mix of both). If this file should have CRLF endings, add it to the .gitattributes file and unset the crlf attribute. You will also get this if core.autocrlf is set to input and all line endings are CRLF. If the file is supposed to be binary, add it to the .gitattributes file and set the binary attribute. If you modify the .gitattributes file, make sure to commit your changes and push them up to the emulab-devel repository. If you want to make a quick change to the central (emulab-devel) repository, without creating a branch in your local clone, first switch back to the master (stashing any local changes on your branch). git commit -a -m "This is a hot fix"
Note that this method of making changes is encouraged for small quick fixes only, e.g., edit file and commit. In addition to our bleeding-edge development repository, called emulab-devel, we also be maintaining a stable repository called emulab-stable. (These repositories are described in the GitRepository page.) The idea is that, on a regular basis, we will update emulab-stable to a stable point of development from emulab-devel. Here, we describe the development-freeze process that we will follow to vet code before putting it into the stable repository. The first full work week of every odd-numbered month will be a code-freeze week. The code freeze begins on the first Monday of the month and ends on the following Monday. If the Monday is a holiday than it will start on Tuesday and end the following Tuesday. During a code-freeze week, our job is to test the master branch of the emulab-devel code base. At the end of the week, if all seems well, we will update the master branch of emulab-stable to match the master branch of emulab-devel. If all is not well at the end of the week, we will decide whether to extend the code freeze or to abandon the month's update of emulab-stable. During a code-freeze week, only bug fixes should be checked into the master branch of emulab-devel. We will enforce this policy by automatically rejecting all commit pushes during the week except those with log messages starting with the magic string "BUG FIX:". We considered more draconian policies, but decided that the "magic string policy" was sufficient and easy to implement. If multiple commits are pushed at once, each individual commit must start with this magic string (if one or more does not, they will all be rejected). Note that this policy does not apply to merge commits, but does apply to all new commits reachable from the merge commit. At the end of a code-freeze week, the emulab-devel master branch will be tagged with stable-YYYYMMDD (where YYYMMDD is the current date) and pushed to emulab-stable's master branch. Then all tags which point to ancestor commits of emulab-devel's master branch are pushed to emulab-stable. EE: I don't understand the need for the process described below. Someone, please elaborate. At the beginning of a code-freeze week, the emulab-devel master will be merged into a branch called devel-during-freeze. At the end of the week, that branch will be merged back into the master on devel and the merged master will be pushed to the emulab-stable repository. Any new features or other development work should be checked into the devel-during-freeze branch during the freeze week. If you attempt to push during the freeze, and one or more of your commits do not contain the "bugfix" keyword, the push will be rejected. If you tried to push one commit which was not a bug fix, don't do that. Either keep your commit to your public repository for now, or push it to a different branch (i.e. one other than master) on emulab-devel. Either way, you can merge it into the development master once the freeze is over. in your own repository, and edit the log message to mention "bug fix:" at the start. A subsequent push of that commit should then succeed. You may then amend your commit as described above, pull from devel again and push your fix upstream. Things are slightly harder if you tried to push multiple commits and at least one of them did not include the "bugfix" keyword. First, please double check all the rejected commits for any change which is not a bug fix. If there are any, then save them (e.g. with git stash, git cherry-pick to a temporary branch, or similar) until the freeze is over. The interactive rebase should now open an editor with a list of lines each corresponding to one of the commits in question. You should delete any lines which refer to commits which are not bug fixes (note that these were saved earlier). If there are any commits which really are bug fixes but were not marked with the "bugfix" keyword, then please change the command at the beginning of the line from "pick" to "edit". Once the editor process exits, it will reapply the correct commits in your history. If there were any commits you marked as requiring editing, it will pause for each one: you can clean up the commit (and presumably insert the necessary keyword if appropriate) by issuing the command git commit --amend followed by git rebase --continue. Once all commits have been fixed, you should be able to push the whole lot to emulab-devel. Use git log to find the commit hash for your bug fix. Use git cherry-pick to apply the fix to your current branch. Since the hash of this new commit will be different from the original one in devel/master, pass the -x option to add the original hash to the commit message. This will make it easier to identify the equivalent commit in devel/master should the need arise. Push the new HEAD to stable/master. At the end of code freeze, do the following to create a new stable snapshot. These steps assume you have a repository with two remotes, devel and stable, which point to the central emulab-devel and emulab-stable repositories on git-public respectively. Stash any changes to your current HEAD that have not been committed. If git status states that you have no changes, you may skip this step. There are two parts to updating a submodule after the source code inside the submodule has been committed and pushed up. For this discussion, we will use the emulab-devel repo as the enclosing repository, and the geni-rspec repository as the submodule within emulab-devel. which pulls down the most recent code for rspec-geni. Now we have to commit this change to the enclosing repository. The emulab-devel repository now references the latest commit to rspec-geni. The protogeni/rspec-geni subdir is now up to date with the latest code.